After watching the nearly unwatchable latest Bond flick, ‘Quantum of Solace’ it was clear to me the prevailing film movement of the decade is Social Realism. Though QoS is at the far end of Social Realism, the stylistic aesthetic of independent European cinema had crept all the way into one of the most exploitive and fantastical of Hollywood franchises – the 47 year old 22 film James Bond series. What is Social Realism? Well for starters it’s a movement which isn’t necessarily exclusive to cinema – an art movement which began in the Depression-era 1930’s reflecting the everyday life struggles of poor working class citizens. 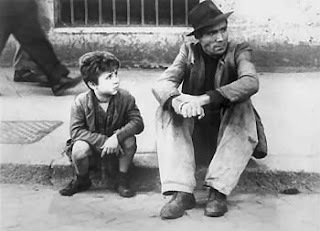 The Italian neo-realism movement of the 1940’s is the most famous – such as Roberto Rossellini's 'Open City' and Vittorio de Sica’s seminal morality tale ‘The Bicycle Thief’. 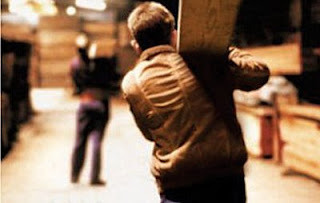 The hallmarks of these films – real locations, unprofessional actors, loosely structured minimalist plotting - has defined this movement ever since. Fast-forward to 1996 and the introduction of the Belgian filmmaking duo, the Dardennes Bros third feature drama ‘La Promese’, but first of their vertite style films, is distinctly neo-realist and won the Palme D’Or. After “La Promesse” came “Rosetta” then “Le Fils” then “L’Enfant” then “Lorna’s Silence” five films which would first influence European cinema and eventually bleed down into American films. Perhaps “Le Fils” is the most influential film of the Brothers, a Best Director Award-winner at Cannes, a simple film about a lowly factory working who takes a local street kid under his wing as an apprentice. For an hour the Dardennes’ camera hovers behind Olivier Gourmet’s shoulder going through the mundane daily routine of his life and his job. Just at the moment the audience might give up on this film the Dardennes sledgehammer us with a dramatic reveal which suddenly gives context to the film jumpstarting a third act which plays upon the best examples of morally challenging complexities of the original Italian realism. Throughout the decade European and international cinema has been dominated with films of this aesthetic. Just look at the success stories from Cannes – “The Class”, “Gomorrah”, “4 Weeks, 3 Months and 2 Days”, "Serbis" – a collection of films which chose to treat formalism like a plague. The filmmakers of these films found inspiration in the details of people lives. Whether its following someone walking through a hallway or across the street characters in these films are defined more by their actions that their dialogue. Charting it's relationship to the original neo-realist dogma the casting of the children in “The Class” exemplifies Social Realism’s preference of non-professional actors. Laurent Cantent cast his film after a lengthy workshop with real Parisian street youth to find the right people to personalities to weave his stories around – a situation not unlike the casting of Lamberto Maggiorani as Guido in “The Bicycle Thief”, an unprofessional plucked from a factory to be De Sica’s viewpoint into postwar Italy. Realism is not the be all and end all though. It's as self-conscious and fashionably trendy as any 'new wave' in cinema - a stylistic choice in many cases which alienate audiences as much as draw them in. Personally, I thought Mateo Garrone's "Gomorra" was transparent hogwash. Garrone's desire to 'keep it real' left me detached and uninvolved with it's characters. It was remarkably empty and had me yearning for the melodrama of 'The Godfather', or the stylish bravura of 'Goodfellas.' Even 'The Class', celebrated everywhere, winning a Palme D'Or was admirable in it attempt to show the real lives of an urban Parisian high school, but also tedious and remarkably undramatic at the same time. By the second half of the decade we saw this movement slowly creep into American films. In the world of Hollywood, it seems to be the norm now to shoot any action scenes off the sticks and handheld for that 'gritty' feel. The days of the locked down formal compositions of the camera in action were long gone, and thanks to the films of Paul Greengrass (Bourne Supremacy and Ultimatum), Steven Soderbergh and Alejandro González Iñárritu handheld dialogue seemed to become the norm as well. These were just stylistic crutches for directors keeping pace with the times, and few of these films actually drew from the fundamental and core humanism tropes of European Social Realism. We had to look to the American independent film movements to find these influences. New York Times critic A.O. Scott’s widely circulated article earlier this year on neo-neo-realism summarized the American version of the trend well, identifying Kelly Reichhart’s Wendy and Lucy” and the three films as Ramin Bahrani (‘Man Push Cart’, ‘Chop Shop’ and ‘Goodbye Solo’) as the quintessential American neo-realist films. A film which Mr. Scott doesn’t mention, which has as much influence from European Social Realism and had the widest audience reach in the U.S. is Darren Aronofky’s ‘The Wrestler”. Aronofsky’s camera which often follows behind Mickey Rourke’s shoulders takes direct influence from the Dardennes’ “Le Fils”. Even Rourke himself, though far from a non-professional, takes influences from his life and career as much as any of the films mentioned above. The 180 degree switch of Aronofsky from the formalism of his three previous high concept features to the stripped down humanistic integrity of “The Wrestler” sums up this trend. Back to 'Quantum of Solace'. To make the connections back to neo-realism, follow this chain. QaS, along with its prequel, 'Casino Royale', was a concerted attempt to 'get back to the real', away from the cartoony of the Brosnan pictures. The visual style of QaS seems to take it main influence from the action as Paul Greengrass's handheld aesthetic and very serious tone of the (last two) Bourne films, a style actually birthed from Greengrass's 'Bloody Sunday' , his documentary-like take on the 1970's massacre in Northern Ireland, a particularly British version of neo-realist real time action film. As mentioned above, the most accessible and entertaining of the above-mentioned films, featuring an immersive performance from Mickey Rourke, told with an unabashed humanist and sentimental unironic tone. The Dardenne bros second Palme D’Or-winning film, dramatizes the redemption of a hardened street youth who sells his baby for money.